DF-Fencing. Fencing Contractors Scotland. What we do. Wooden fences built to customers specification. Supply & Erect or erect only. Garden gates, any size & shape. We build fences, using sustainable materials, that will last a lifetime at a very competitive price. Rylock, plain wire, electric or post and rails. All types of gates supplied and erected. Repair work and re-posting undertaken. We have a bespoke track dumper with a mounted Bryce 180 degree swivel post chapper, designed specifically for us by Kattrack in Ayrshire, that makes even the most difficult fencing conditions easy! Deer & stock fencing in upland and lowland areas. 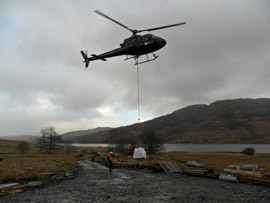 We have extensive experience in arranging and managing helicopter material drops in difficult to reach terrains. Field & Paddock Fencing to ensure that your horses are kept safe and secure. We are able to build to your specification using Post & Rail, Hi-Tensile or Electric on a permanent, semi-permanent or temporary basis. Like our Stock & Forestry fencing, we use Tornado Wire's ground breaking Equine Fencing range that ensures quality and safety. All our contractors have extensive experience and hold all the required industry qualifications & certificates. Our contractors have either been hand picked by Duncan or have been highly recommended to us.